a) Total mileage and trip mileage recorder. Fuel consumed since the last reset. c) Average fuel consumption since the last reset. The value is displayed after having travelled at least 400 metres since the last reset. This value is displayed after a speed of approximately 20 mph (30 km/h) is reached. e) Estimated range with remaining fuel. The value is displayed after driving 400 metres. f) Distance travelled since last reset. g) Average speed since the last reset. h) Mileage before service or oil change. 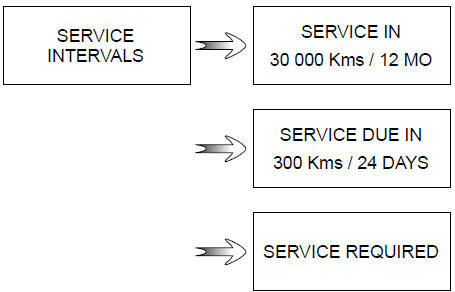 distance equal to 0 miles or service date reached: the message “service vehicle” is displayed accompanied by the warning light. 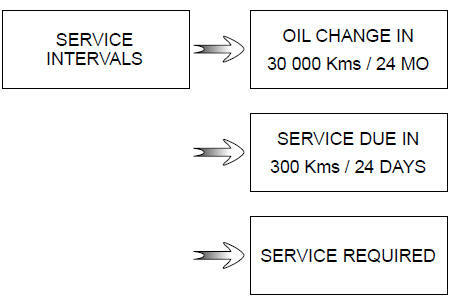 The vehicle requires a service as soon as possible. Resetting: To reset the distance before service, press and hold one of buttons 2 or 3 for approximately 10 seconds until the display shows the mileage permanently. NB: if a service is performed without changing the engine oil, only the mileage before the next service should be reset. In the event of an oil change, both the distance before the next service and the next oil change should be reset. Mileage before service With the ignition switched on and the engine not running, and the selected display is “Mileage before service”, press one of buttons 2 or 3 for about 5 seconds to display the mileage before a service, then briefly press one of buttons 2 or 3 to view the range (distance or time remaining before the next service). range equal to 0 km/miles or service date reached: the message “service vehicle” is displayed accompanied by the warning light. The vehicle requires an oil change as soon as possible. Depending on the vehicle, the mileage before an oil change varies according to the driving style (frequent driving at low speed, door-to-door journeys, extensive use at idling speed, towing a trailer, etc.). The distance remaining until the next oil change can therefore decrease more quickly in some cases than the actual distance travelled. Resetting: To reset the mileage before a service, press and hold one of buttons 2 or 3 for approximately 10 seconds until the display shows the range permanently. i) Reset the tyre pressure. Please refer to the information on the “Tyre pressure loss warning” in Section 2.
j) Cruise control and speed limiter programmed speed. Refer to the information in “Cruise control” and “Speed limiter” in Section 2. Please refer to the information under “Clock and exterior temperature”. operating fault messages (check the injection system, etc. ).